Started as a grocery store in 1938. Sold to Boyd and Wurthmann seven years later. The original, green counter built in the 40’s with seating for 9 is still a local favorite and in use today at their establishment. In the 50’s, the demand for more restaurant services increased so they separated the market from the restaurant and began to serve breakfast and lunch. Their specialty was homemade pie and good Amish style cooking. The desire for good Amish home cooking and their pies have made them a landmark in Berlin. They are a favorite for both the local and visitors to the area. They offer 15-20 different homemade pies daily depending on what fruit is in season. Debbie and I were there in Oct 2013 for 3 days and enjoyed a dinner and breakfast meal. Every time we pass the restaurant it was full and a couple time there was a line out the door, waiting patiently to get a seat. For breakfast I had the “Wreak” A breakfast haystack with biscuits, HF, eggs, cheese, meat, vegetables, topped with sausage gravy,( I had the half size not the full). Debbie enjoyed the homemade pancakes. 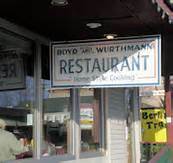 This was the restaurant the we first experienced “ Amish peanut butter spread”. They have it on the tables as a condiment. This stuff is the best sweet and creamy, homemade in their store.